After years of feverish anticipation from Tesla fans, the electric car pioneer has finally delivered its long awaited SUV, the Tesla Model X. Though it'd been kicking around in concept form since 2012, an initial batch of six finished Signature Edition vehicles was handed over to early pre-order customers today at an event outside Tesla's factory in Fremont, California. The Signature Edition Model X, which is already sold out, came with every available option, and sold for upwards of $US130,000 each (around £95,000), putting it in the same price bracket as Tesla's high-end Model S.
If you were not one of the six people who drove away in their very own Tesla Model X today (and let's face it, it's highly likely that you are not), you can pay $US5,000 to reserve one right now. But be warned – you won't be getting it until some time well into next year. The Model X will be available in two versions – the standard 90D model will set you back $US132,000, while the P90D, which comes equipped with the Ludicrous Mode found in the Tesla Model S, will be priced at $US142,000. Though the 90D is no slouch, going from 0 to 60 mph (97 kph) in 3.7 seconds with a range of 257 miles (413 km), the P90D has the distinction of being the fastest SUV in the world, boasting an acceleration of 0 to 60 mph in 3.2 seconds with a range of 250 miles (412 km), giving most supercars a run for their money – that's even faster than Porsche's electric concept car, the Mission E.
Though it shares most of the same features as the Model S, the Model X has a few unique ones of its own – it features DeLorean-style 'falcon wing' doors, which allow you to easily open your car doors in tight spaces. 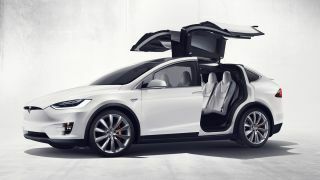 They're also are quite large, allowing people to enter into the second and third rows of the vehicle – yes, the Model X has three rows of seats. It's also extremely safe – Tesla CEO Elon Musk told event attendees that the Model X was awarded 5 stars in every safety category, stating that there's only 6.5 percent of injury in a high speed collision. Tesla are claiming this is the world's cleanest SUV on the inside too, with a biohazard button which activates the advanced air filtration system, filling the cabin with "medical-grade" air. And finally, the Model X is the world's first tow-capable electric car, though we imagine that towing heavy objects will reduce both its acceleration speed and driving range.